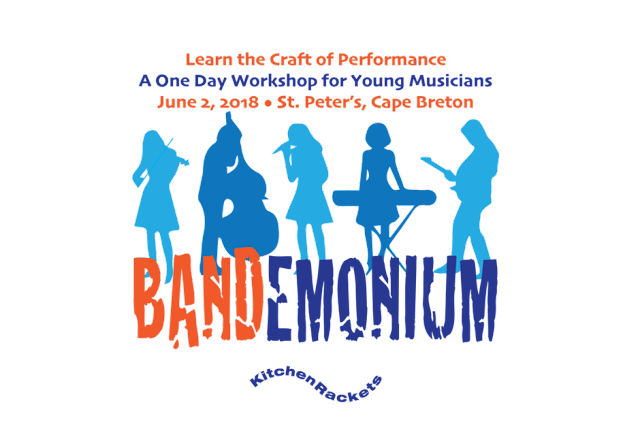 Cape Breton Tourism Spotlight: Bandemonium Is Coming to St. Peter's June 2nd, Get Your Tickets Now for One of The Best Concerts of the Tourism Season. Bandemonium Is Coming to St. Peter's June 2nd, Get Your Tickets Now for One of The Best Concerts of the Tourism Season. What’s BANDEMONIUM? We know you can play an instrument. Yes, you can sing. You’ve got the moves. But are you entertaining? Can you perform? Captivate and hold an audience? Command the stage? Look and sound professional? If you play an instrument, sing, dance, and want to improve your stage presence and performance skills: BANDEMONIUM will be a great experience for you. Come along. Join a band, choose a tune, practice and hone it to perfection. Learn important stage and performance skills from our faculty, some of the most sought-after professional artists in the country. Perform at our Saturday night All-Star Concert - starring your band AND our amazing faculty. Where is it? It’s at EREC in St Peter’s on Saturday, 2nd June, 2018. Registration and welcome at 9am. Oh, and a special, limited-edition t-shirt! How do I apply? Quickly! Today! There's an application form below that you can fill in to sign up – closing date for applications is Friday, 25th May 2018. We have only 30 places available for participants and they are filling up quickly, so don't dawdle - act now. This is a great opportunity for local students to have direct coaching from some of Cape Breton’s finest musicians, teachers and performers, as well as to spend social time in a musical setting with other learners. For further information please contact us by email at info@kitchenrackets.org. This concert follows KitchenRackets All-Star tradition, featuring each year's Music Camp faculty, and sometimes introduces new young musicians in performance. This year our BANDEMONIUM ALL-STAR Concert introduces our new young bands of the day in the first half, with their instructors and coaches performing in the second half. As always, this year's ALL-STAR Concert promises to be a highlight of Cape Breton's music scene this summer. • in D'Escousse at the Groundswell. • You can also call for tickets at 902-345-2996 or email us at info@kitchenrackets.org. Tickets are $20 in advance, or $25 at the door. Doors open at 6:30 PM and the show kicks off at 7:30 PM at the St. Peter's Lions Hall. Watch for news on this website or Like us on FaceBook to keep posted on updates (use FB LIKE PAGE link at bottom left of screen). In the second half of the concert, BANDEMONIUM coaches Allie Bennett, Brian Doyle, Colin Grant, Scott Macmillan, Keith Mullins, and Kelli Trottier appear on-stage with featured guest artists Rachel Davis & Darren McMullen. The evening's festivities will be hosted by Cindy Day, Official Meteorologist for the Cape Breton Post.